What's in a name? Shobhaa De's tweets on Sridevi's antim sanskar venue gets trolled massively. 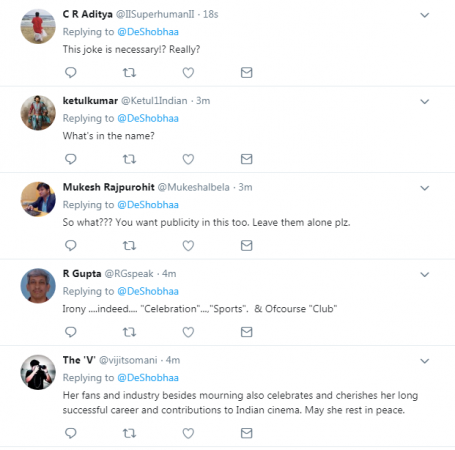 Shobhaa De is known to enter a controversy often. And this time she decided to speak about Sridevi's funeral venue. Sridevi's mortal remains are currently at Celebration Sports Club in Mumbai for her fans, family and Bollywood industry to pay their condolences and last respects. Meanwhile, Shobhaa De took to Twitter to comment on the same. She first wrote: "Irony! What's in a name? A lot. 'Celebration Sport's Club ' as a venue for a Diva's funeral ceremony. India mourns its beloved #Sridevi [sic]"
And within a few minutes deleted the above tweet and wrote a new comment: "Irony of ironies. A Diva's condolence meeting at a venue named ' Celebration Sport's Club.'" In no time, the journalist, columnist, social commentator, opinion-shaper and author of 18 books — as her Twitter bio reads, was trolled and how! Fans thought that this joke was not necessary. One user commented: "Shobha this whole Sri Devi episode has been one of joy n celebration for all the chanells. Its no wonder her condolence meeting is at Celebration Sports Club...This is one death where I have seen no solemnity or grief shown by the TRP seeking heartless media." The other fan said: "This joke is necessary!? Really?" When Shobhaa De heard the news of Sridevi's death, she wrote: "Saddest news. Our luminous and supremely talented Sridevi has left us to become one if the brightest stars in the firmament. RIP." 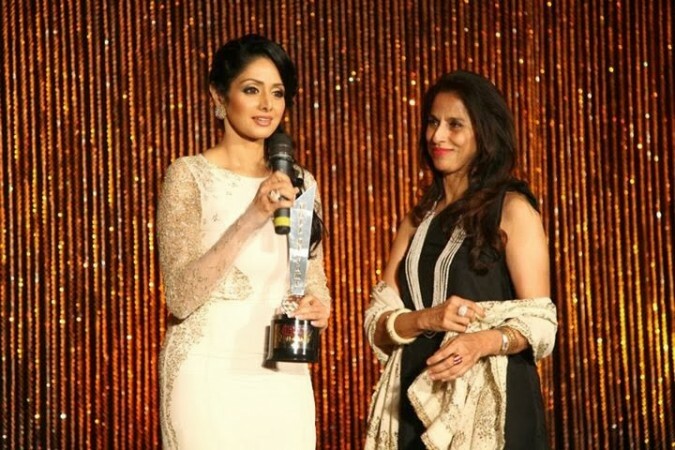 For those who don't know, Sridevi was from a Tamil family. And it's a belief in Tamil Nadu (where Sridevi was born) that the soul is sent with happiness to the eternal world with flowers, music, and dance. A number of days—between 10 and 16, after a person has "reached the abode of Siva," a special ceremony called a Kariyam is performed. Tamil tradition requires people to avoid saying that a person is dead. Instead, the person is said to have reached the world of Lord Siva, or to have reached the world of the dead or the ancestors.